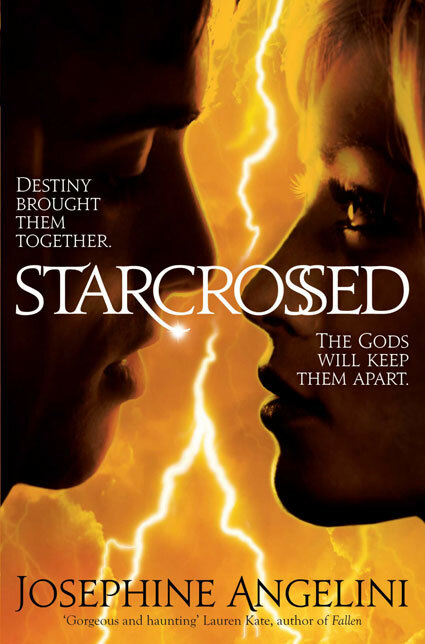 An ancient curse means Lucas and Helen are destined to loathe one another. But sometimes love is stronger than hate, and not even the gods themselves can prevent what will happen next . . .
Helen has always known she was different, she is faster and stronger than her friends but suffers from crippling shyness that cause stomach cramps whenever she finds herself at the centre of attention. She has spent her whole life trying to blend into the background, instinctively she knows she has to keep her abilities a secret but she has never understood why she has them. When the Delos family arrive she finds herself filled with hatred every time they are in the same vicinity. In fact the first time she sees Lucas she actually tries to kill him! Before long Lucas and his family are able to give Helen the explanations she has always wanted, nothing is what she expected and the Fates have some nasty surprises up their sleeves. 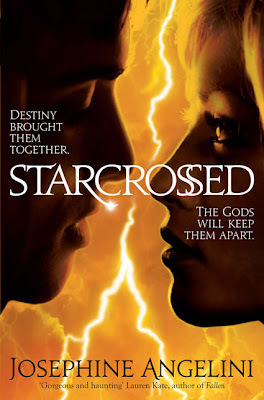 I have to admit that I kind of put off reading Starcrossed for a long time, I loved stories based on Greek mythology but was nervous about picking it up because there was so much hype surrounding the book when it was released last year. The only reason that I'm not kicking myself for not reading it sooner is that I don't have to wait a year for the second book Dreamless! Josephine Angelini surpassed all my expectations, I thoroughly enjoyed Starcrossed and am eager to find out what happens with next. One of the things I loved most was that there isn't a case of insta-love between Helen and Lucas, in fact they have been cursed to hate each other so they don't exactly start out as friends. I felt for Helen from the moment we met her, she was so painfully shy and just wanted to fade into the background and disappear. Throughout the story she becomes much more sure of herself and really starts to grow into her own person which was great to see. Of course Lucas is hot but there is much more to him than that, he is also caring and protective and he stands up for Helen even going against his family for her. I also really enjoyed the way the author has woven Greek mythology throughout the story, she has done a fantastic job of explaining why Helen and Lucas have such strong reactions to each other and how their family histories have brought them to this point. I found it fascinating to see how each of the characters are connected to each other and trying to figure out which of the Greek gods they represented. The secondary characters are all well drawn and interesting in their own rights, I loved Helen's relationships with her father and her best friend Claire. Claire often added some light relief to the story and I loved her reaction when she found out about Helen's secret. Lucas comes from a large family and they all have different abilities, strengths and weaknesses. His mother is the glue that holds them all together and it was great to see how respected she was by the others even though she was the least powerful amongst them all. I will be really interested to see where the story takes us next and Dreamless definitely won't be sitting on my to read pile for a year waiting for me to get to it! I liked the Greek mythology aspect of this one, but I really struggled to identify with Helen. I really liked the instant hate as well, especially in contrast to insta-love. Their anger and fighting were absorbing to read. @ Zoe - If you like Greek mythology then I'm sure you'll really enjoy this :o) I hope you like it as much as I did & thanks so much for following! @ Bookworm1858 - the insta hate made a nice change didn't it! I loved the fact that they weren't instantly in love :o) I'm glad you enjoyed this one too! I'm so glad you finally read this and liked it! I LOVED it. But then an ARC of Dreamless appeared, one I'd been waiting forever to read .. and I still haven't read it. I don't quite get it.